Salmon and shrimp may be popular fare, but leading chefs prove that less familiar local seafood can earn top honors. Spot prawns are the largest shrimp species to be found in the cool murky depths of the Pacific, from Alaska to San Diego, where the leggy creatures burrow in sediment and swim up to feed on smaller prey. During the season when fishermen haul up spot prawns in “pot” traps, an exceedingly sustainable method of catching shellfish, their firm, langoustine-like flavor makes them a favorite at restaurants up and down the West Coast. That includes diners seated at the white linen–covered tables of Providence, a beloved fine-dining establishment in Los Angeles. There, in a dining room decorated with elegant interpretations of fishing nets and barnacles—even the wallpaper evokes schools of well-behaved rainbow jellyfish—chef Michael Cimarusti’s spot prawns roasted in salt are one of the restaurant’s most renowned dishes. Waiters in bespoke suits fuss over the shrimp’s reddish shell tableside, smoothing away the salt crust before giving them one, long slice—halving them from tail to right between the googly eyes. Splayed open and nearly naked, save for a half lemon stuffed full of the prawn’s crackly roe, the lone prawn is a highlight of the chef’s tasting menu, which runs $210 for about a dozen courses. Not all seafood is so revered. In fact, diners may not even recognize some of the fresh wild fish prepared at Cimarusti’s restaurant, one of three in the city to boast two Michelin stars. While spot prawns have long been featured on the menu, more strange creatures from the deep showed up during the inaugural season of the Dock to Dish program at Providence. Cimarusti is the West Coast pioneer of a small program that delivers a box of local, sustainable, wild-caught seafood to his kitchen. On the East Coast, where Dock to Dish was cofounded by Chef Dan Barber of Blue Hill Restaurant in 2012, local fishermen now support 20 restaurants. Waiters have been touting catch-of-the-day specials for ages—but too often the just-caught pitch is a bit of a misnomer, considering 91 percent of seafood in the U.S. is imported, according to federal regulators at the National Oceanic and Atmospheric Administration’s fisheries. In a blunt irony of sustainability across genres of trade, the U.S. trade deficit in seafood was second only to oil in 2011 at $11.2 billion, and it gets worse every year, regulators say. Part of the challenge of getting sustainable, traceable local fish—fish that wasn’t caught by slaves or through practices that damage the ocean’s ecology—is the demand for a narrow variety of favorites, such as salmon and shrimp. If Americans regularly ate more diverse seafood, restaurants wouldn’t have to rely on fare from distant seas to give them what they want. That’s partly why Dock to Dish is starting with top chefs who invent food trends and are dedicated to ethical food. Before a mystery food can become a trend, a chef figures out a way to serve it that proves irresistible. Between August and the end of October, the kitchen at Providence received weekly deliveries of ocean fare from the Santa Barbara coast. Every week, a 75-pound wild grab bag of sea cucumbers and sea snails came in alongside sea urchin and yellowfin tuna, much like you might find an assortment of pomegranates, pears, and brussels sprouts in a CSA box this time of year. Caught by a collective of 16 commercial fishers, the new outpost of the West Coast sustainable fishing program is part of a growing movement to connect seasonally available fish to a restaurant scene that has increasingly timed serving vegetables and fruits to when they are ripest. Cimarusti recently invited reporters—including the lucky author of this piece—to sample a menu of Dock to Dish plates at Providence, and there are definitely more traditionally upscale treats among the dishes, such as the pillowy omelettes stuffed and topped with sea urchin from local waters, swimming in a puddle of Champagne beurre blanc speckled with osetra caviar. But not every course signaled luxury so effortlessly. “Everything that we used from Dock to Dish that was new or different or may seem shocking to people or may seem beneath a restaurant like this, you can only turn that around with effort and thought,” Cimarusti said. Transforming what’s most readily available in the Pacific into a $210-a-person dining experience isn’t always easy. 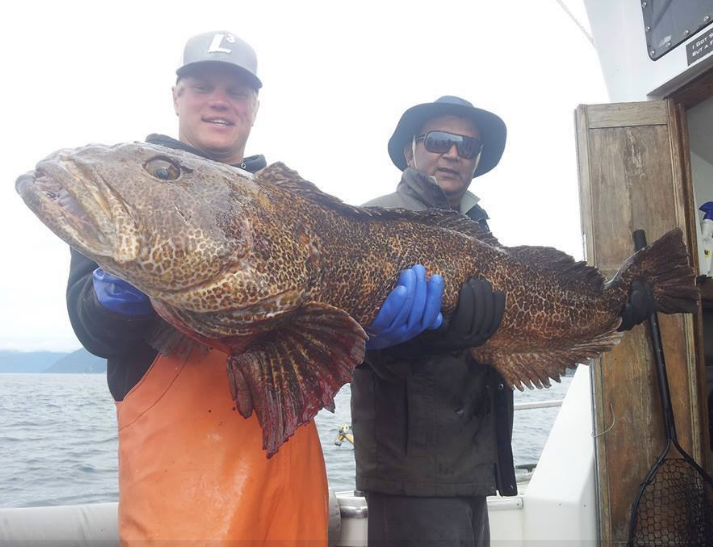 A California lingcod—a leopard-speckled bottom-feeder that can grow to be rather unwieldy—is likely unfamiliar to most diners. In a foodie realm that is dazzled by the endlessly rich—caviar, truffles, foie gras—it can be risky to opt for the mundane, particularly in fine dining, where every kitchen has high standards. Yet, Cimarusti stands by the low-rent catches of the Dock to Dish program that his kitchen was able to elevate and whip into delectable bits. Under Cimarusti’s care, the lingcod is served with a hazelnut and sea lettuce pistou and accompanied by mussels. Thinly sliced geoduck—a sustainable but very phallic-looking clam—becomes the protein of a lovely salad with little batons of zucchini and yuzu dressing. “They may be inexpensive or they may not be the marquee-type ingredients you’re used to seeing on a menu, but they all came through the door in pristine shape; they were really beautiful,” Cimarusti said in an interview. The idea behind serving more humble swimmers is to improve the sustainability of seafood in restaurants and at home. This December, Cimarusti will open a fish shop in the heart of Los Angeles: Cape Seafood and Provisions in Fairfax Village will sell wild and sustainable fin fish and other well-researched and verified bounties of local waters. From nose to tail, from farm to table—American gastronomes have embraced the earthy aesthetic and food movement once pioneered by Alice Waters’ Chez Panisse, gobbling up the gently raised vegetables and livestock grown just over yonder on a local farm. Now the question programs like Dock to Dish are asking is: Can the zeal of those ever-salivating masses, who have embraced eating seasonally and sustainably, extend to the wide-open seas with the same gusto? By embracing farmers markets—which have steadily increased in number for more than a decade—many average Americans have also embraced seasonal truths that a cherry is best eaten in July, when the sun has plumped it to perfection, and a pomegranate’s seeds are bound to be juiciest in the fading days of fall, when the trees’ long and slender boughs dip toward the earth under the weight of its globes of fruit. Fisher Sean Barrett cofounded Dock to Dish and is well aware of the kind of influence a handful of top chefs can have on the rest of the restaurant food chain, just as Waters did for vegetables, as well as seafood advocates, conservation groups, and fishermen. He praises everyone from fishers to eaters for “successfully reviving a genuine ‘catch of the day’ system of seafood sourcing in numerous ports in a relatively short span of time.” Small programs like his and local chefs' are increasingly pushing for better transparency in seafood, where too often fish have been, well, fishy for consumers—mislabeled as sustainable when they’re not, or of unknown origins altogether. At Cimarusti’s restaurant, an ethical approach to food is hardly new—in the midst of California’s drought, the water used washing vegetables is hauled up to the roof to water an herb garden, and Cimarusti doesn’t serve unsustainable species such as bluefin tuna or shark. That’s part of why he was such a good match for the program, Barrett said. “Michael is a rare breed of chef who skillfully weaves together a devout allegiance to sourcing practices that are geared specifically toward the long-term sustainability of wild fish in our oceans with an equally high level of concern for the last remaining independent U.S. fishermen still out here working on the water, and somehow morphs all of his extraordinarily detailed social and environmental initiatives and consciousness into world-class, award-winning seafood, consistently and without fail,” Barrett said. As the Dock to Dish season came to a close for Cimarusti this October and fishers move to work different waters, he reflected on the need for people to be more in touch with their fishers, to know their fishmongers, to learn that at different times of year the same fish can be fatty or lean, and how to prepare it accordingly. And Cimarusti hopes seafood fans will learn to eat with the seasons too—not just in his restaurant but at home by getting to know their fishmongers, like his staff at Cape Seafood and Provisions. And fans of the spot prawn, mark your calendar: They’ll be back in February.